Can balance training improve core stability in sprinters? Researchers in Spain investigated a proprioceptive training program designed specifically for sprinters. They randomly assigned 33 sprinting athletes (mean age 21 years old) into a control or experimental group. 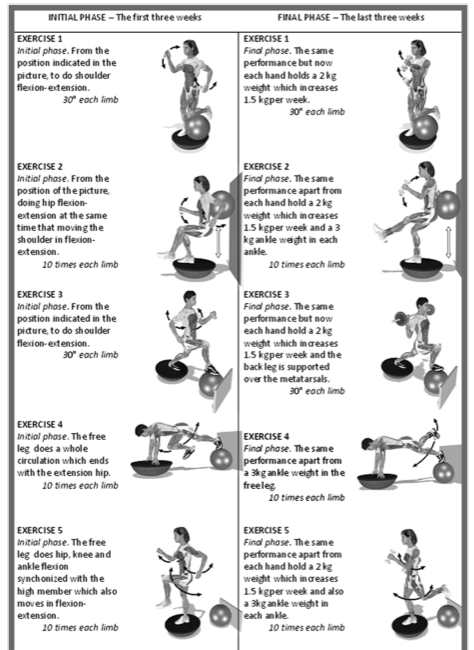 The experimental group performed a 6-week specially-designed balance training program for sprinting athletes using a BOSU ball and stability ball. They were evaluated before and after the training program for their balance by measuring their postural stability and center of gravity control. The researchers found statistically significant improvements in a few measures of postural stability and gravity center of control using the Biodex Stability System. I found a few issues with this study. First of all, the title of the article suggested core stability was measured; in addition, the authors summarized that their program “slightly improves core stability.” However, there was no direct measure of core stability in this study. I assume the authors are inferring that slight improvements in the center of gravity control equate to improvements in core stability, which may not be accurate. Core stability may be related to postural stability, but many other factors (improved neuromuscular efficiency, foot strength, and specificity of training to name a few) may have contributed to the increase in postural stability. My other main issue with the study was that the outcome measures were not adequate in my opinion. Efficacy of training programs in athletes should focus on performance outcomes when possible. Subjects in this study should have been evaluated for sprint performance (such as time) to assess the efficacy of the program. In addition to the minimal positive effects on balance, this program lacks the evidence to support it as an effective training program in sprinting athletes. REFERENCE: Romero-Franco N, Martínez-López E, Lomas-Vega R, Hita-Contreras F, Martínez-Amat A.Effects of proprioceptive training program on core stability and center of gravity control in sprinters. J Strength Cond Res. 2012 Aug;26(8):2071-7.